France, hosting the climax of the European Championships for the third time, will carry the hopes of the nation as they seek to match their triumph of 1984, the last time they staged the finals. Coach Didier Deschamps and his squad will inevitably be among the favourites to lift the Henri Delaunay Trophy in the Stade de France on 10 July. France have a proud football history both on and off the pitch. Frenchmen such as Robert Guerin, Jules Rimet, Henri Delaunay and Gabriel Hanot all played crucial roles, respectively, in the creation of the game's world federation FIFA, the FIFA World Cup, UEFA and its European Championship, as well as what is now known as the UEFA Champions League. On the pitch, it was Frenchman Lucien Laurent who scored the ﬁrst goal at the inaugural FIFA World Cup ﬁnals in 1930 and France who hosted the ﬁrst European Football Championship - then known as the Nations Cup - in 1960. Les Bleus ﬁnished fourth on that occasion, but the next time they hosted the ﬁnals, in 1984, they won the European crown. France were hosts of the 1998 FIFA World Cup and followed up another victory on home soil with a second UEFA EURO triumph in neighbouring Belgium and the Netherlands two years later. Since then, France's best achievement is runners-up, on penalties, to Italy at the 2006 FIFA World Cup. Didier Deschamps, who captained Les Bleus to glory in 1998 and 2000, now coaches the national team and wants to use home advantage to win another major title. Two years ago, France reached the quarter-ﬁnals of the FIFA World Cup in Brazil before losing 1-0 to eventual champions Germany. Since then, Deschamps has maintained the core of the team that, with two years’ more experience, should be capable of going deep into the tournament. France have prepared for “their" ﬁnals without playing any competitive matches since 2014 (the hosts qualify automatically for the ﬁnals), but Deschamps has left no doubt in his players’ minds that they have been competing, in every game, for their place in the squad in June. For the most part he has used a 4-3-3 system, but has experimented with shapes and substitutions in a series of quality friendly matches against the likes of Spain, Belgium, Portugal, Brazil and England. Hugo Lloris has been one of the best and most reliable goalkeepers in Europe for a decade. A three-time Goalkeeper of the Year in France, while playing for Nice and Lyon, he then moved to England's Premier League with Tottenham in 2012. In front of him, Arsenal's Laurent Koscielny is considered to be one of the classiest central defenders in the European game. Ahead of them is a solid midﬁeld anchored by Paul Pogba from Juventus. Pogba failed to achieve an early career breakthrough at Manchester United, but capitalised on a move to Italy with Juventus in style. He was ofﬁcial man of the match when France defeated Nigeria 2-0 in the second round of the FIFA World Cup in 2014 and was outstanding in Juventus’ run to the ﬁnal of the UEFA Champions League in 2015. 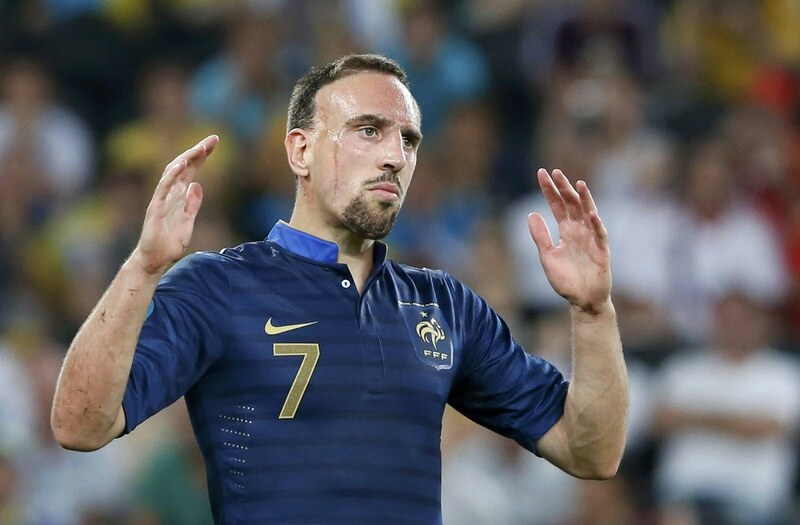 Deschamps no longer has the attacking danger of Franck Ribéry at his service, but the likes of Antoine Griezmann, Olivier Giroud and Anthony Martial will provide him with plenty of ﬁrepower. Griezmann is one of Europe's most highly-rated strikers and is coming off the back off an impressive campaign with Atletico Madrid which led to a penalty shootout defeat to arch-rivals Real Madrid in the UEFA Champions League. Yet he never played senior club football in France, joining Spain's Real Sociedad after impressing in a youth tournament in 2005 when still only 14. With 32 goals last season, he is one of the top favourites for the Golden Boot. Centre-forward Giroud has gained plenty of experience with Arsenal, while Manchester United's Anthony Martial, who became world football's most expensive teenager when he left Monaco for Old Trafford last summer, has shown plenty of promise. 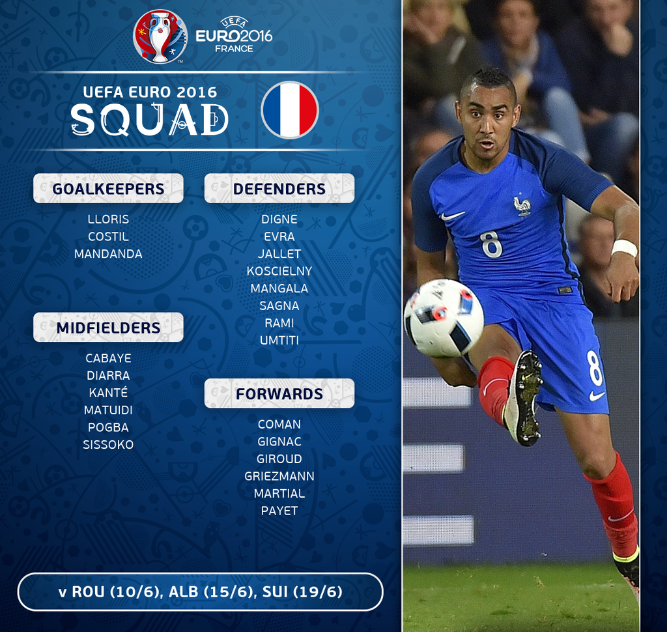 With such talent running through the team, France are one of the prime favourites to light up the tournament. I think it's about time France stepped up in a big tournament, they have been starved of success for 16 years and many times in the past problems both on and off the pitch have blighted their chances. Karim Benzema would have been an even bigger miss had Antoine Griezmann not had such a wonderful season with Atletico, and Paul Pogba is definitely a contender to be the best on show in France this summer. I think France will reach the semi finals, a vast improvement on their group stage exit in 2008 and premature quarter final elimination in 2012. 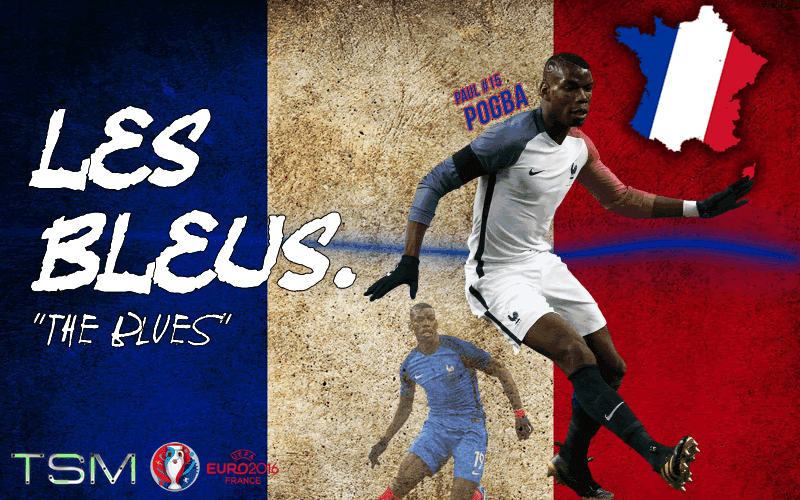 Euro 2016 Preview Series: France.